Want to Help Your Child Catch Up in Reading? Your child might have been diagnosed with a learning difficulty, a teacher might have raised concerns, or you have noticed something is amiss with your child’s reading and/or spelling. Our Catch-up at Home Packs are here to help! 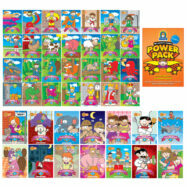 The Power Pack – games and activities for you to conduct 10-15 minute daily, one-to-one sessions with your child. Tackles difficulties with phoneme knowledge, blending, segmenting, automaticity and fluency with any set of phonemes. Practice Books – removes all the stresses of a story, characters, grammar and storyline to your little one’s headspace to concentrate on decoding. Like learning to swim – we don’t start off in the deep end we start in the shallow end, practising our stroke. This is what the Practice Books are doing – they are our phonics floaties! Decodable Stories – build confidence by using these 100% decodable stories whilst expanding comprehension and vocabulary. When he started year one he was in the lowest reading group, in three months he has moved up 5 reading groups. He’s so happy, he feels good about himself, he tells me “he’s a really good reader”. Difficulty reading and/or spelling basic words like: bug, mat, wax, shin, thick, muck and sang. Difficulties with reading or spelling words such as; sweet, might, apron, foam and statue. Children who struggle with making the correct spelling choice for a word. For example, spelling the word ‘cheek’ as cheak or check. Difficulties with reading or spelling words such as; moist, elephant, fairy, staircase, smudge and bridge. Children who need further support in making the correct spelling choice for a word.